Make this fun paper craft with your kids. It is a perfect gift for a teacher, mother, or grandparent. 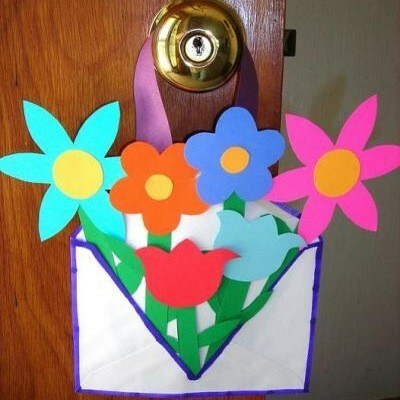 This is a guide about making an envelope flower basket. Hang brightly colored flowers almost anywhere with this simple to make idea. Approximate Time: 30 - 45 minutes. Open the top of the envelope. Use marker to decorate the envelope. Draw and cut stems and leaves from green paper. Draw and cut flower blossoms from various colors of paper. Glue blossoms and leaves to stems. Put a little glue on the backs of the stems and slide the stems into the envelope to fill your flat basket. Cut a basket handle from paper and glue this to the top of the envelope. Once the glue dries, your envelope basket is ready to hang.